In addition to our Training Camp Takeaway series that kicked off last week, we at PFF are also hot on the trails of some intriguing rookies to keep your eyes on as we progress through the preseason. Some rookies are wowing during their first training camp and may be pushing hard for some well-deserved, extra snaps during preseason games. 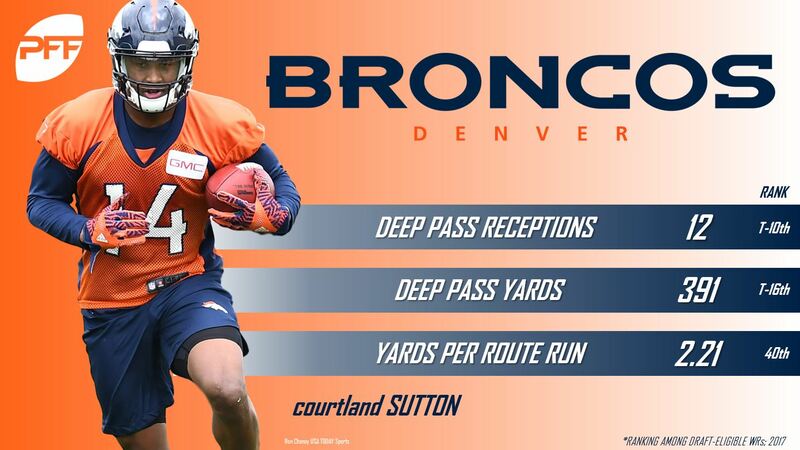 The Broncos have their top two WRs locked in with Demaryius Thomas and Emmanuel Sanders, but Sutton could factor into multiple receiver sets with a strong preseason. While Sutton’s size is the first thing that comes to mind, he moves well for a bigger receiver and he can be more than just a red-zone weapon for Denver. While his production took a slight step back last season at SMU, he’s shown he’s capable of using his body to win down the field and his large catch radius gives quarterbacks a bigger margin for error. This could be a big bonus for starting QB Case Keenum who was already one of the most accurate passers in the NFL last season with the Vikings finishing tied for third in adjusted completion percentage at 76.5 percent. Sutton is set up to excel as a possession receiver at the NFL level with his size and body control, but he’ll surprise with his ability to get downfield. In 2016, Sutton caught 574 yards on deep passes, 13th best in the nation, and his 12 deep pass receptions ranked T-10th among draft-eligible receivers a season ago. Sutton will be a player to watch during the preseason. Nnadi could be a big factor in the Chiefs’ interior defensive line rotation as we enter the 2018 season. The third round selection might look like a pass-rushing 3-technique, but his best position at the NFL level is likely nose tackle. The rookie possesses a stout frame that’s difficult to out-leverage and generate movement if one-on-one. With the Chiefs, Nnadi figures to be a force in stopping the run as he produced an 11.0 percent run stop rate last season with the Seminoles. That could be vital for the Chiefs as Bennie Logan was the only interior defender who recorded a top-20 run stop rate for the team last season at 11.8 percent, and Logan has taken his talents elsewhere as he signed with the Tennessee Titans during the offseason. Although Nnadi has impressive mobility for a nose tackle, his pass-rushing ability is limited generating only 19 pressures last season, and he was shut out in seven different games. With three straight seasons of PFF grading above 82.0, the rookie’s unique skill-set will be hard to ignore in camp. The Chargers had the best pass-rushing duo in the NFL last season with Joey Bosa and Melvin Ingram III. The two combined for the most pressures in the league in 2017 with 151 and will remain fixtures on the defensive line this season, when healthy. Although Nwosu could have limited opportunities rushing the passer during the season, the former Seminole will have an impact as a key depth piece on the edge and at linebacker. He’s a capable underneath zone defender whose athleticism can be used as a weapon on blitzes and stunts in the NFL. His production took a big leap in 2017 at Florida State, having recorded only three sacks and 43 total pressures during his first three seasons before tallying 10 sacks, 63 pressures, and an incredible 10 batted passes during his final season. Nwosu spent 41.4 percent of his snaps in passing situations rushing the quarterback and 15.3 percent in coverage throughout his collegiate career. He will figure to be a versatile chess piece in the Chargers’ defense. A health scare caused Hurst to fall in the draft, but the Raiders might have gotten a steal along the interior defensive line. With last season’s starter at defensive tackle, Eddie Vanderdoes, recovering from a torn ACL suffered in the final game of the season, Hurst has already been impressing with the first team defense in training camp. During his time at Michigan, there wasn’t another interior player that could come close to his production as a pass-rusher. Hurst is incredibly explosive off the ball and almost always won the leverage battle along the interior. The rookie’s 49 pressures were far-and-away the most of any interior defender, and he also held up well against the run with 31 stops, third-most among draft-eligible interior defensive linemen. 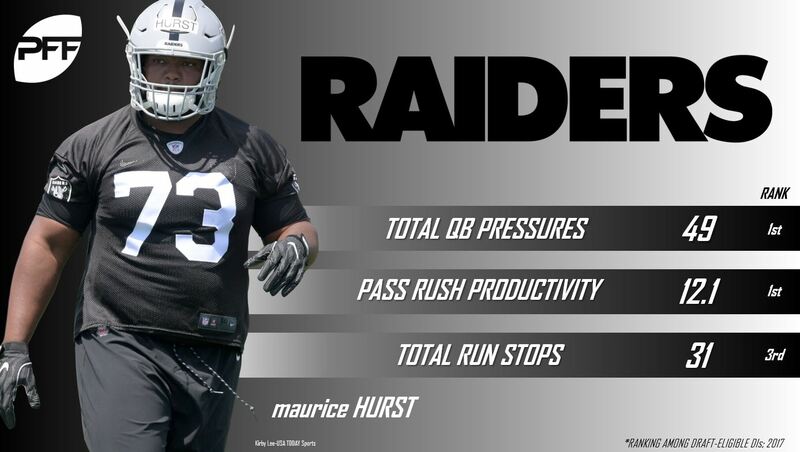 Hurst’s well-rounded ability will be a welcome sight to the Raiders defense where no interior linemen ranked in the top 20 in total pressures or run stops a season ago. Hurst’s relentless motor will catch the eye of many during camp and throughout each game of the preseason. Hurst could be a force in 2018 as a rookie.